Each tree is to be individually considered and the general description of the work to be done is to be assessed in relation to the shape, size, character, condition, site and specie of each tree. A documented risk assessment is to be carried out prior to commencement of works. All operations shall be completed so as to leave each tree in an acceptable, well-balanced and safe condition. Each branch shall be removed using the triple cut method where other methods may incur unnecessary injury to the tree. All final cuts should be made into wood making possible occlusion by the growth of callous tissue. All final cuts will be made at the branch collar, with the branch collar remaining intact. Large pruning cuts on trees require particular attention with regard to the branch collar. Under no circumstances will any “smoothing or flush cuts” be made. All cuts will be made in such a manner as set out in the guidelines of BS3998: 2010. Heavy branches will be removed in sections and under cut to avoid tearing the bark and lowered by ropes and slings to avoid damage to the tree and its surroundings. We shall ensure that all sections fall to the ground in a controlled manner. Extreme care will be taken when using chainsaws to remove epicormic shoots so as not to damage the main stem or stems of the tree. Pruning will be carried out with secateurs or sharp pruning knives only in the first 5 years of a tree’s life. Dead, diseased or damaged branches will be pruned back to the corresponding branch collar. 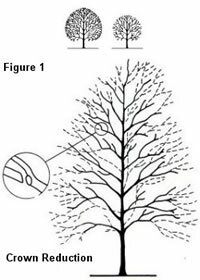 In the case of crossed rubbing branches, the branches will be assessed, pruned or removed accordingly, whilst ensuring a reasonable overall shape is maintained. Bark wounds are to have any broken, splintered wood and or damaged bark removed. We will comply with the Highways Act 1980 Section 154 in removal of all such branches. Growth shall be removed to ensure a clearance of 2.4 metres over footways, 5 metres over carriageways, 1 metre from all street lighting, traffic signs, traffic lights, street name plates etc., and 2 metres from windows or adjacent property. Trees will be evenly thinned throughout the whole crown as set out in the guidelines of BS3998: 2010. 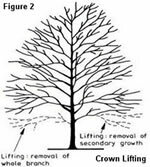 Crown reduction will reduce the overall height and spread of the tree crown by a specified percentage, by shortening the branches to suitable growth points to maintain as far as possible the natural form and proportion of the species. Crown reduction alleviates biomechanical stress by reducing both the leverage and the sail area of the tree, and can allow retention of a tree in a confined space. It can also be used to create a desired appearance or to make the tree more suited to its surroundings. The operation of crown reduction is a matter of judicious pruning and will not be constructed as lopping or topping. All branches will be cut back to a growth point and all final cuts should be made at an angle so the tree incurs the least possible injury in accordance with the latest recognised pruning practices as set out in the guidelines of BS3998: 2010. The main aim of formative pruning is to produce a tree which in maturity will be free from any major physical weaknesses and which will complement the management objectives for the site. 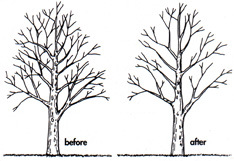 If, in order to influence the structure, shape or size of a tree crown, formative pruning has been started in the nursery, any pruning at or soon after planting should be kept to a minimum in order to retain an adequate leaf area. 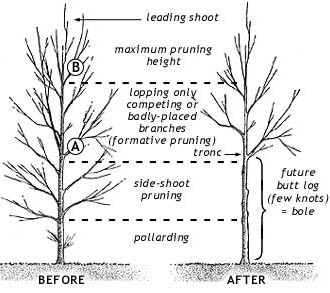 Formative pruning should normally be resumed three to five years later, but if the tree has been allowed to develop an unsuitable branch structure, some of the branches may be shortened or removed at an earlier stage of establishment. The early removal of all the lowermost branches should, however, be avoided if possible, as it could impair the development of a sturdy taper in the stem. If branches need to be removed or shortened to deal with undesired patterns of growth, this should be done in stages so as not to remove too much leaf cover at any one time. Ideally, none of the selected branches to be removed should exceed 20 mm in diameter at the point of attachment to the stem. At least two-thirds of the height of the tree should always consist of live crown. Within areas of high usage or formal plantings, potentially weak unions in young trees should be managed so that only one dominant stem or branch continues to grow from such a union. Where the total removal of an unwanted co-dominant stem or branch would create a large wound, it should instead be shortened, thus causing it to lose dominance as set out in the guidelines of BS3998: 2010. The straight fell of trees is the removal of trees as a single unit. Straight felling will be limited to such situations which pose no risk of damage to any property whatsoever, including specially prepared grass areas. Trees to be straight felled will be guided by the use of pulling ropes/cables and felling wedges as necessary to ensure the correct direction of controlled fall. Where a large or heavy main stem of a tree is to be straight felled, branches, crash matting or a large rubber tyre will be placed on the ground in the direction of the tree’s intended fall to protect the underlying surface. Section felling is the dismantling of a tree with the use of lowering ropes, cables and slings adequate to the task. All cut off sections are to be either lowered to the ground or thrown by hand in a controlled manner. Grubbing out stumps (Removal by hand tools) involves the complete removal of the stump by digging around and under the stump and cutting all roots adjoining to it, by use of mattocks, graffs, pick axes, spades, shovels etc. Stump grinding (Removal by machine) involves the removal of stump and root bole to a specified depth, generally between 150mm and 300mm. Upon completion of stump removal, remaining holes will be back-filled with soil or grinding waste to leave a level surface, unless otherwise specified. The installation of steel cables to provide additional support for parts of the tree at risk from breakage. Cables will be fixed to eye bolts or lag screws and secured around appropriate thimbles by splicing, bulldog grips or similar. Normally no eyebolt/lag screw will support more than one cable, unless previously discussed due to a lack of anchor points. Installation will be aimed at sharing stress of weak points by counterbalancing across the crown. Clamps, bands and unprotected wire wrapping will never be used. Cables will be placed so as not to rub against branches. All works to be carried out in accordance with BS 3998 2010.